Breakfast. Purple cabbage mixed with carrot, apple, pecans and goat cheese. No fancy photos for this post since when Daves at work, its just me and the point-and-shoot. Kind of a ho-hum day, food wise, but I thought it might be time to post another daily menu. I have been experimenting with various breakfast ideas. The cabbage salad made for a refreshing start to the day. I was also desperately trying to use up as many vegetables as I could as it was almost time to pick up the weeks produce at the CSA farm. I created a muffin that omits honey/sugar/etc using only the natural sweetness of coconut and blueberries. Recipe forthcoming! 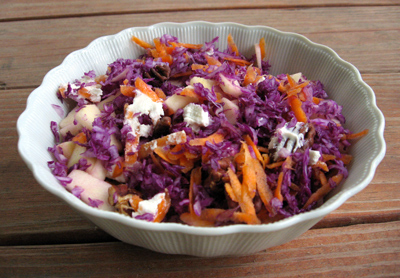 Grated cabbage and carrot mixed with with chopped apple, a few pecans and some goat cheese. The remainder of one childs primal coconut blueberry muffin after she dropped it on the carpet and the dog licked it. I cut off the dirty bits but still no takers. Oh, darn. Lunch. Sauteed kale, leeks, summer squash, carrot, garlic and basil, topped with bacon. 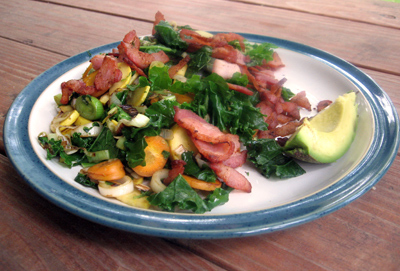 Sauteed kale, leeks, summer squash, carrot with garlic and basil, topped with 4 slices bacon.